I though about namako having three lines on top, but I proposed another one of my propositions which I though was simpler to write. I was thinking that a star for kin could be good idea ? and some sort of representation of “two halves” for pata. "star"/"asterisk" for "birth"/"beginning"/"new" is probably not international enough. Maybe. Looking at a (the synonym of kin), I could imagine an exclamation mark with an asterisk instead of the dot (or "a" in the case of a). I present you my “final selection” which are the glyph people have liked the most, as you can see I haven't included “apeja” and “pata”. sitelen mi li pona ala pona, tawa sina? Well, I still don't like the proliferation of exclamation points ad 'namako' may be too like 'sin' even if they have some common features semantically, but in general this is a very nice answer to the problem of the missing hieroglyphs. I like how your "oko" has similar elements like "ken", so the style is preserved. Good work! 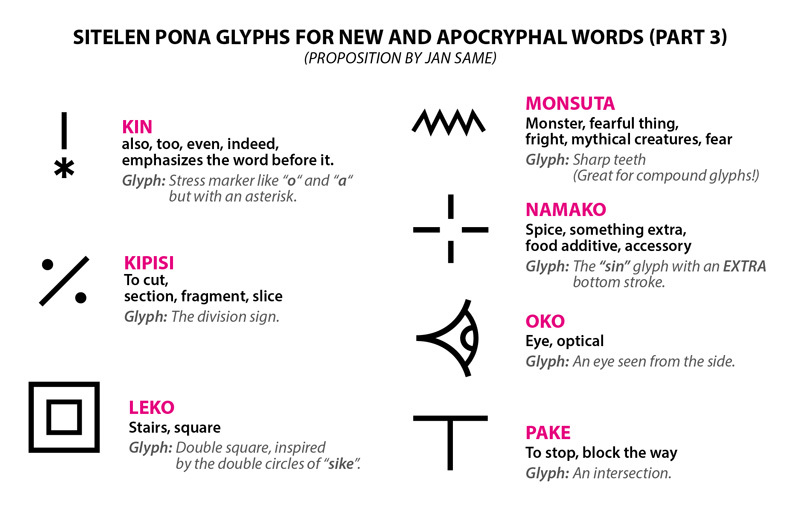 It was really hard to find the right glyph for oko !